Happy New Year! I trust you had a fantastic festive time with your loved ones. I'm looking forward to helping you make 2019 your most successful trading year yet! 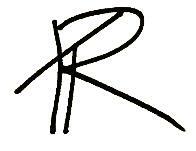 I've spent the last two weeks, doing intensive technical analysis on all my charts on the watch list. Over the next five weeks I'll be sending you my top five predictions on gold, the JSE, the rand, the euro and oil. Here's my first prediction of the year. Much of gold's rise end of last year/at the beginning of this year was due to a couple of things. The Fed's announcement of easing interest rates hikes in 2019/. Then also global growth is falling. Today, the World Bank cut global growth and as well as in major economies due to trade wars, rising interest rates etc. From the end of last year to the beginning of this year, we’ve seen gold rally from $1,200 per ounce up to $1,292. This was due to a number of reasons. First was the Fed’s announcement to ease interest rate hikes in 2019. This means investors would spend more on investments such as gold rather than save their money in the banks. With more spending leads to a rise in higher prices. This leads to a negative outlook on investing in world markets, which leads to investors piling their money into safe havens like gold. So we can see a couple of reasons why gold is on the rise. And to top it off, the charts agree that there is more upside to come. 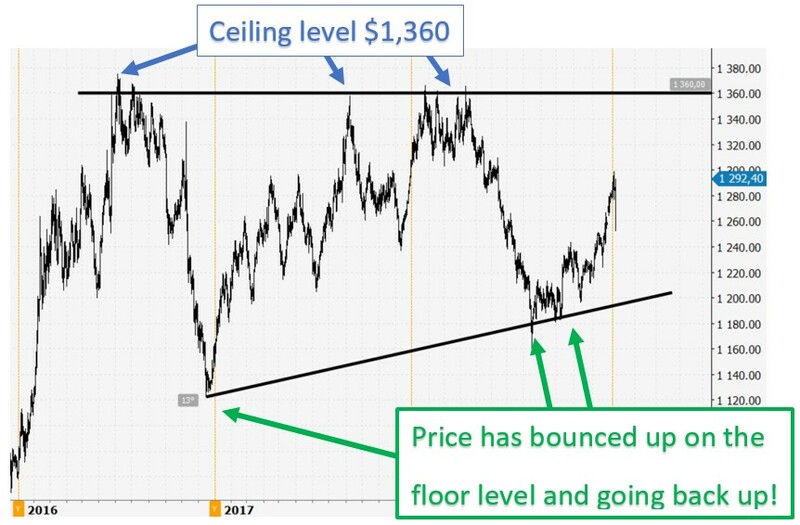 On the daily chart, since July 2016, Gold has been bouncing in a range between a high of $1,360 (ceiling level) and a low of $1,140. What’s interesting is this isn’t just an ordinary sideways formation. You’ll note that gold has created a yo-yo effect where price moves up to the same high level at $1,360, turns around and then drops to a higher low price level. 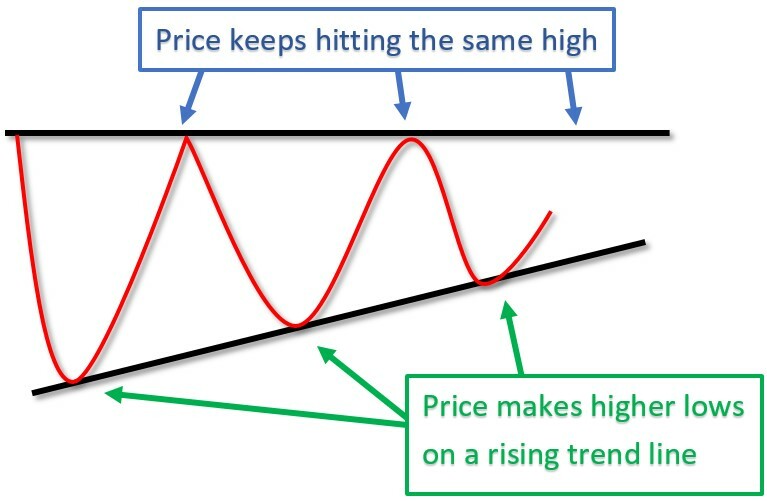 In technical analysis terms, this formation where price moves to the same high level and drops to higher lows, we call this an ascending triangle. Let’s remove the chart so you can see what I mean in simple terms. You do NOT have to be a financial wizard. You do NOT have to have any trading experience. About 20 minutes a week is all you need. We’ve seen gold’s third bounce on this rising trend line. This means, not only have we confirmed it’s in an ascending triangle formation, but also that we can easily expect the price of gold to rise back to the top of the ascending triangle again to $1,360. 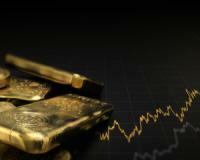 There are three ways you can bank big on gold this year. First, you can simply buy the Gold CFD at $1,292, put in a small deposit of just R359 ($13,90) per CFD and hold it all the way to $1,360 where you can bank a 489% gain. Here is the calculation for the gain. Second, you can look at any gold stocks which correlate with the current rise with the gold price. I’m talking about stocks like Anglo Gold or Harmony. Third, you can skip the analysing, thinking and doing any of the work and let me do it for you… I have two signals in the pipeline waiting to send out, which can happen any day. Click here to read more information so you don’t miss out.